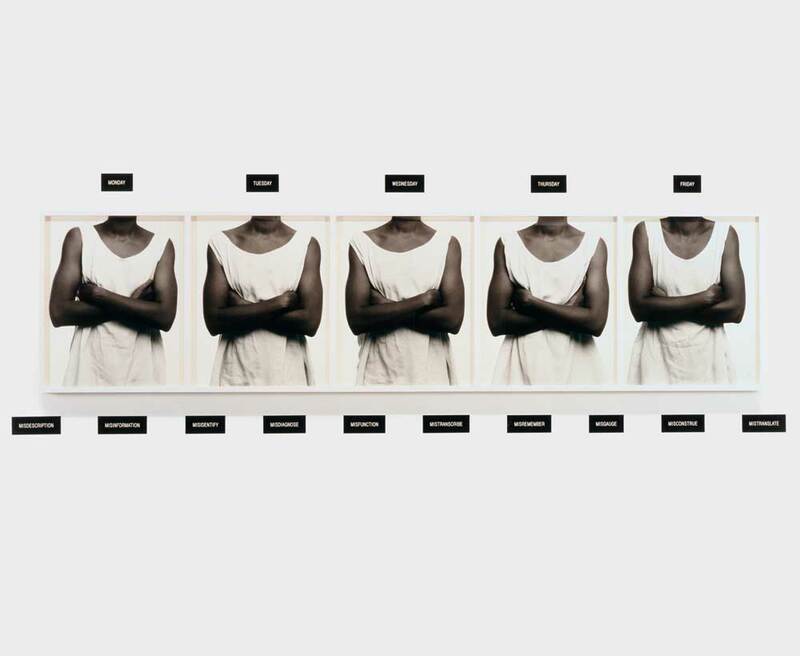 Lorna Simpson, Five Day Forecast, 1988. Five silver gelatin prints, in one frame, fifteen engraved plastic plaques, 20 x 24 in. (50.8 x 61 cm.). Courtesy of the artist and Salon 94, New York. © 1988 by Lorna Simpson. Permission to reprint may be obtained only from the artist. This work is featured on the Spring 2017 issue of Signs. Feeling a strong need to reexamine and redefine photographic practice for contemporary relevance, I began producing work that engages the conceptual vocabulary of the time. With unidentified figures as a visual point of departure, I use the figure to examine the ways in which gender and culture shape the interactions, relationships and experiences of our lives in contemporary America. Lorna Simpson was born in 1960 in Brooklyn, New York, and received her BFA in Photography from the School of Visual Arts, New York, and her MFA from the University of California, San Diego. Simpson first became well-known in the mid-1980s for her large- scale photograph-and-text works that confront and challenge conventional views of gender, identity, culture, history and memory. Using the camera as a catalyst, she constructs work comprising text and image, parts to wholes, which comment on the documentary nature of found or staged images. Her work has been exhibited at the Museum of Modern Art, New York; the Museum of Contemporary Art, Chicago; the Miami Art Museum; the Walker Art Center, Minneapolis; the Irish Museum of Modern Art, Dublin, among many other venues.